For 25 years, Mary Pope Osborne’s Magic Tree House® series has captivated the imagination of children and won the admiration of parents and educators for the devotion to reading the books inspire. With strong brand recognition and an impeccable reputation for quality, the Magic Tree House series has sold more than 134 million books worldwide. Location: Dallas Children’s Theater at the Rosewood Center, 5938 Skillman (at Northwest Hwy), Dallas, Texas 75231. Start Time: 4:30 PM. 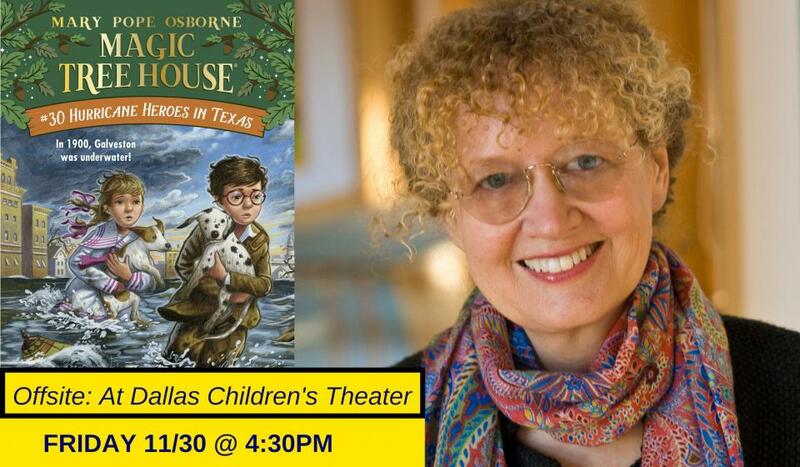 The Osbornes will speak about the new books and the Magic Tree House's Holiday Musical: A GHOST TALE FOR MR. DICKENS. Their presentation (approximately 45 minutes) will be followed by a 20-minute Q&A session that includes questions from audience members. Books: Each ticketholder will receive his or her copies of both HURRICANE HEROES IN TEXAS and TEXAS: A NONFICTION COMPANION TO MAGIC TREE HOUSE #30 upon admission to the theater. Performance Note: From November 16 through December 23, Dallas Children’s Theater presents its production of Magic Tree House's Holiday Musical: A GHOST TALE FOR MR. DICKENS, based on Magic Tree House Merlin Mission #16: A GHOST TALE FOR CHRISTMAS TIME. Show tickets and more information are available at DCT.org or at the theater box office at the Rosewood Center. The musical is recommended for ages 6 and up. HURRICANE HEROES IN TEXAS (Magic Tree House series #30): In the series’ most recent adventure, Jack and Annie are caught out in the rain in the most dangerous Magic Tree House mission yet! When the magic tree house whisks them back to Galveston, Texas, in 1900, they find out a big storm is coming. But even though there is rain and wind, no one believes there is any danger. When the storm grows, seawater floods Galveston and everyone needs help. Jack and Annie have a little bit of magic and a lot of hope, but will it be enough? #1—the position of the Magic Tree House (MTH) series on the New York Times bestseller list with the release of virtually every title. 280+ continuous weeks on the New York Times bestseller list — longer than any other series besides Harry Potter. 467 appearances on the Indie Bestseller List (the American Booksellers Association’s list for all US independent bookstores) since the list began in 2006 … and every week since 2012. 56 fiction books in the MTH series and counting. 34 nonfiction companion MTH Fact Trackers, with more to come. 134+ million MTH books sold worldwide. 33 languages in translation, in 30+ international markets. 100+ other books for children and young adults written by Mary Pope Osborne outside the MTH series. Highly regarded among parents, teachers, and librarians for its power to instill a passion for reading, Mary Pope Osborne’s award-winning Magic Tree House series is an international phenomenon that has sold over 134 million books worldwide since its debut in 1992, and has been translated into 33 languages in over 30 international markets. Mary Pope Osborne has made it her mission to combat the childhood literacy crisis and help children discover the magic of reading by third grade. Studies have shown that if a child cannot read at grade level by the end of third grade, he or she is four times more likely to drop out of high school. A recent study initiated by Mary and conducted by Susan B. Neuman, a respected professor of childhood education and literacy development at NYU, shows that including the Magic Tree House books in classrooms is seen as a major motivating factor in helping children not only learn to read, but also in helping them want to read. Since 2012, through her own philanthropic programs, Mary has donated $3,000,000+ (retail value) of her books to Title I schools in both urban and rural communities. In turn, more than 500,000 Magic Tree House books and Fact Trackers have been put in the hands of children in need.